The Welcoming Economies Global Network (WE Global) provides member organizations opportunities to learn from each other as part of its mission to strengthen the work, maximize the impact, and sustain the efforts of individual local initiatives that welcome, retain, and empower immigrant communities as valued contributors to local economies. During WE Global-funded city-to-city visits, a delegation led by one core member organization visits another core member organization to exchange ideas, learn from each other’s successes, and inspire new approaches and commitment to immigrant-focused economic development. Visits typically include meetings with local stakeholders including government, chambers of commerce, economic development agencies, and social service providers. CenterState CEO created an agenda filled with opportunities to meet with both institutional change-makers and community advocates. After two and a half days, we were filled with new ideas, inspiration, and a desire for more time. We were impressed by the continued importance of place-based economic and community development, throughout all of our meetings. Nearly every single person spoke about place and location as an active consideration in their work. In cities like Dayton, Syracuse, and many of the other WE Global cities, where segregation and disinvestment in communities of color continue to cause concern, an active conversation about the importance of place-based targeted development was most definitely welcome. The Upstate Minority Economic Alliance (UMEA) seeks to address how companies are missing out on the best talent. It was created in partnership with CenterState CEO and is the first minority chamber in the upstate and central NY region. UMEA recognized that there has been lack of minority representation in leadership, particularly in business communities and is working to actively create political and economic capital. Lunch with My Lucky Tummy founder, Adam Sudmann. 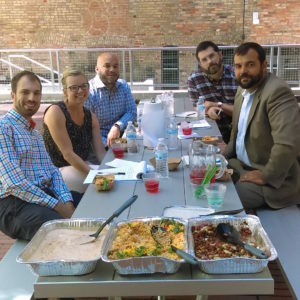 Between international dinners hosted twice a year and creating a restaurant that provides opportunities for immigrants and refugees to showcase their talent with limited risk, My Lucky Tummy is a unique (and delicious) business incubator! A few highlights about the importance of place came from meetings in the Northside Neighborhood. Nicole Watts, the founder of HopePrint, explained that the approach of HopePrint is focused on relationships. As she began to serve immigrants and refugees in the community, she decided to make the commitment to move into the neighborhood where she was spending so much of her time. She explained that she felt she couldn’t continue to work in the community without authentically being a member of the community. HopePrint recognizes the value of being directly connected to place and how that connection can create lasting change. Many immigrants and refugees have never been inside a native-born American’s home before. The intimacy involved in having home-based meetings changes the dynamics and way information is presented and received. Learning English around a dining room table is very different from learning English in a classroom. Creating a mutual mentorship between families where refugee and American-born families are collaborating for a common goal is a very different model from the traditional mentor relationship of one giving and the other receiving. Changing these power dynamics not only changes the way others perceive refugees, but also how refugees perceive themselves. Working toward empowerment and creating opportunities to thrive is a major goal of HopePrint. 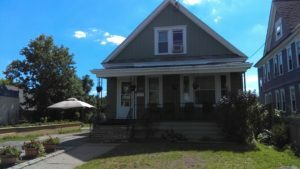 HopePrint owns three homes in the Northside Neighborhood where community members come together to share, learn, and collaborate. Another stop in the Northside neighborhood was the Northside Learning Center and the Stalwart Group. Again, both organizations have a deep connection to place. Northside Learning Center is a community based organization that creates hope by working with entire families and looking at them as a unit rather than individual needs. Programming includes a family based literacy program where parents are required to attend if the child is involved. 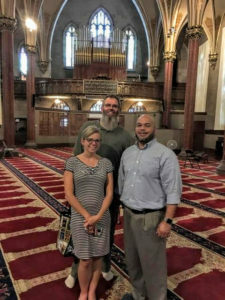 Furthermore, recognizing that the majority of refugees worldwide are Muslims, the Learning Center was involved in a project that converted the vacant Catholic Church next door into a Mosque. The Mosque of Jesus, Son of Mary was a beautiful example of how changing communities can continue to share sacred space. Continuing to think about community revitalization, Irfan Elahi with the Northside Learning Center and Stalwart Group has been working to remodel homes in the immediate blocks surrounding the Northside Learning Center. Irfan came to Syracuse from LA, and like Nicole with HopePrint, decided to make Northside his home. He also recognized the importance of being connected to the neighborhood by being a member of the community. One of his many projects is to purchase homes from the landbank and work with a team of refugees who are apprentices, learning construction skills, to remodel the homes and then rent back to refugees at an affordable rate. Visiting Syracuse gave us additional ideas and renewed our commitment to the work being done in Dayton. It’s always interesting to visit another city that has similar size, demographics, and history. Throughout the visit, I found myself taking photos and sending them to friends in Ohio with the caption, “Dayton or Syracuse?” Our cities are remarkably similar, and through the WE Global City to City Visit, we’ve gained an opportunity to share lessons learned, best practices, and visions for our futures.